This highly sought after, rarely available, Center â€œ01â€ unit is a 3 BR/ 2.5 BA w/ a stunning almost 180 deg view of the Gulf. From its 36 ft long open Terrace, flanked by its 2 screened lanais, the Gulf almost surrounds you. This unit has been beautifully renovated with Wood Cabinets, Granite Counter tops, Stainless Steel Appliances, and raised Kitchen Ceiling. Oversize Tile on the Diagonal is wonderfully accented by wood floors in the bedrooms The 2.5 baths have been completely renovated. The â€œ01â€ units are hard to find and do not last on the market very long when they do become available, so hurry. 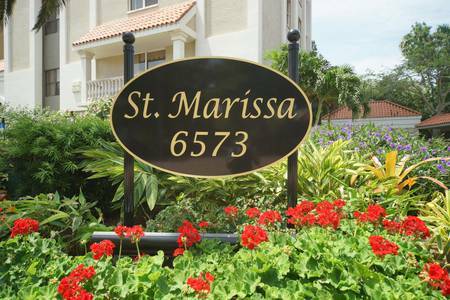 St. Marissa is one of the most desirable of the Pelican Bay High Rises and has a manned gated entry. You can walk or drive to either the North or South Beach Tram Station where you enjoy a relaxing ride to your Private Beach Club with your chairs, umbrellas and cabanas waiting. Pelican Bay amenities include Sailing / Sea Kayaking, Estuary Canoeing / Kayaking, a full-service Fitness Center, 8 Lit and 10 non-lit Har Tru Tennis Courts, and The Club Pelican Bay, which is a member owned Golf Club with 27 Holes of challenging Golf, exceptional Dining and a variety of Social Activities.